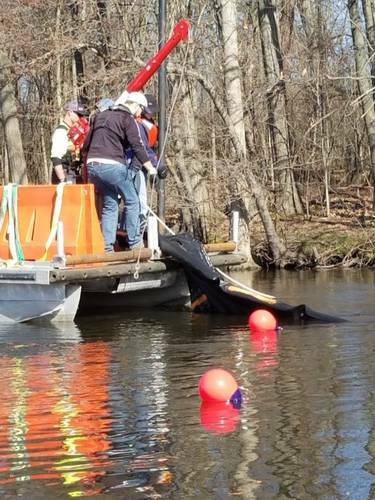 Members of the U.S. Coast Guard Research and Development Center oil spill response research team are testing an underwater barrier system designed to mitigate the impacts of sunken oil traveling along a river bottom. Mitigating or reducing the impact of oil is usually accomplished by minimizing the spread of oil on the river bottom and deflecting it, either to a collection area for recovery or away from sensitive areas. The underwater barrier system tested in Kalamazoo at the end of April 23 was specifically designed for deployment in inland water bodies such as rivers, streams and small lakes. Although no oil was used, the test provided an opportunity for RDC to deploy the barrier, monitor its effectiveness, and retrieve it. Some of the parameters that RDC monitored were the barrier’s position, motion, sag, scour and tension over a period of 18 to 24 hours. Researchers deployed the barrier in the Kalamazoo River near the upstream region of Morrow Lake, and tested two different anchoring methods. The anchoring method is dependent on river depth, type of substrate of the river bottom, and resources available to oil spill responders at the time of an incident. Local U.S. Environmental Protection Agency representatives and the Northern Michigan regional director from the office of Sen. Gary Peters, D-Mich., observed portions of the test. This is one of several efforts the RDC is undertaking to improve spill response capabilities for non-floating oil because of the increasing transport of oil sands and diluted bitumen, known as dilbit. Depending on environmental conditions and the type of oil spilled, oil can sink to the bottom of inland water bodies and travel with the current. 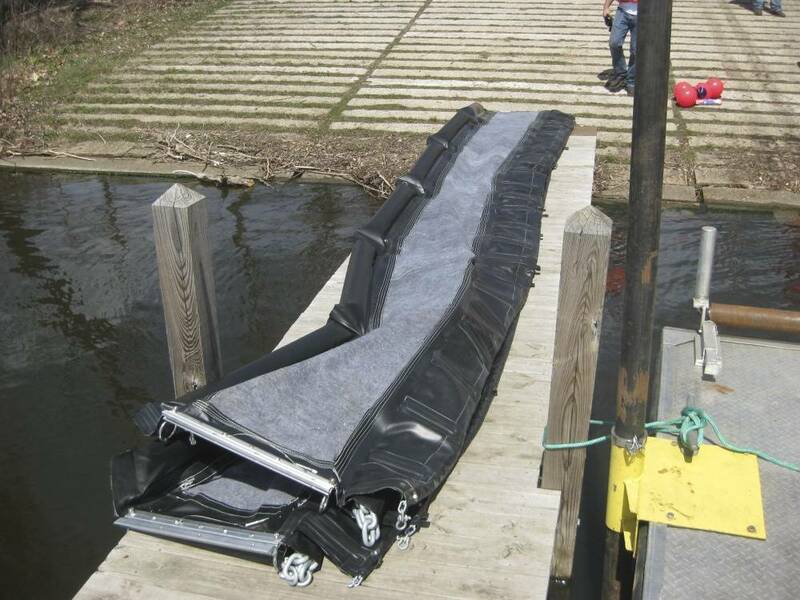 RDC returned to Michigan in late May to test an underwater barrier system designed for offshore environments and large lakes. The test was conducted from Coast Guard Cutter Hollyhock in Lake Huron near Port Huron. RDC will consolidate results and lessons learned from both tests into a single report and make it available to the public.